Very similar shrubs. The alder buckthorn is only much more common. They grow everywhere, on the north-western coast for instance even side by side. In places the common buckthorn has its autumn flowering time. In September it is usual that the trees have fruits as well as little white flowers with green sepals. During the fruit-bearing period it is actually easier to tell the trees-shrubs apart. 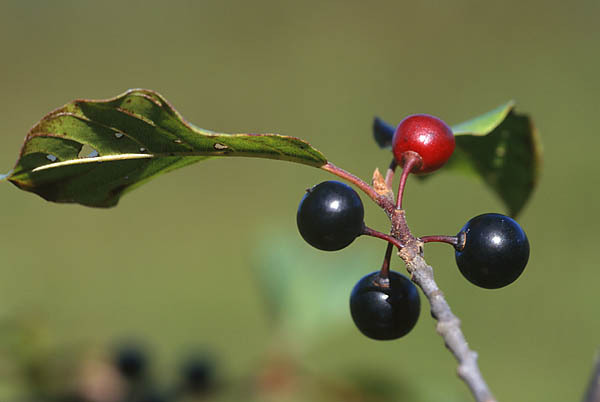 The berries of the alder buckthorn are botanically drupes with two large seeds. The half-ripe berries are still red and they are especially toxic, containing prussic acid (hydrogen cyanide). 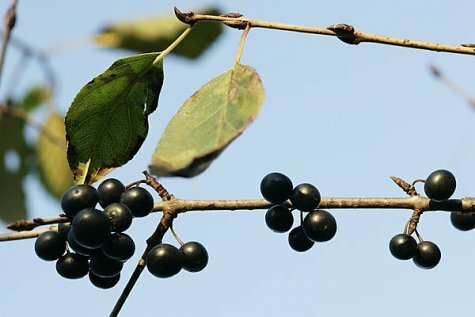 People in the old days called them poisonberries, and the alder buckthorn itself, the snake tree. The leaves of both are leathery and shiny. The leaves of the alder buckthorn have an entire margin, the buckthorn leaves have a serrated edge and the leaves are set in pairs and opposite each other. In addition we find thorns on the branches and in the tips of them. The fruits are likewise toxic, and it isn’t really particularly important which is the more poisonous.